Although Naked Conversations (2006) and Groundswell (2008) were published a few short years ago, it feels like the case studies took place eons ago. The case studies in these books echo what early companies have done to move the needle forward from Dell Hell to Dell Swell, Lego product innovation, Microsoft evangelist blogs and beyond . Yet fast forward to 2011, it’s still amazing to realize that social business (formerly called social media marketing, formerly called social media, formerly called citizen media, formerly called business blogging) is still very young. How young? 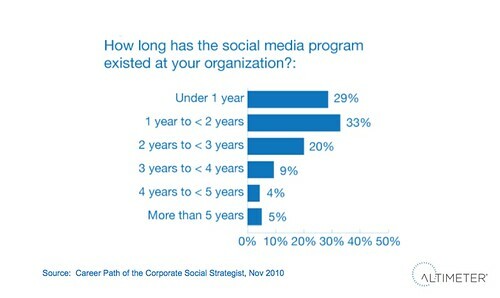 Well, in our Nov 2010 report on the Career Path of the Corporate Social Strategist, we surveyed 140 enterprise-class corporations and found out that the largest segment of respondents have only had formalized social media programs (beyond just experimentation) for 1-2 years. Fast forward to Feb, 2011 It starts to average just about 2.5, hence while we call 2010 the year of social business formation. It’s really early friends, in fact if your company has deployed social business in a formalized way today, you are early pioneers. In fact, I like to use the metaphor it’s like the Internet in 1997, companies are just starting to deploy their corporate websites in a formalized way –not just from the spare latitude under the IT guys desk –in many companies there are now internet groups that manage the corporate web properties, it’s a an official career. Just to emphasizes, most companies have only had formalized social media programs for 2.5 years, this space is just starting to green shoot. In fact, a majority of the respondents were currently in marketing, but I know the business decision making will also spread to the support teams, product innovation, then supply chain. If your company has formalized your program (find out what companies are spending on), you have staff, headcount, budget, and are organized in hub and spoke or multiple hub and spoke you’re way ahead of the majority of companies, you’re a pioneer, and hats off to you.